AT&T leverages Argonne’s climate modeling and infrastructure resilience expertise to benefit Southeastern U.S. 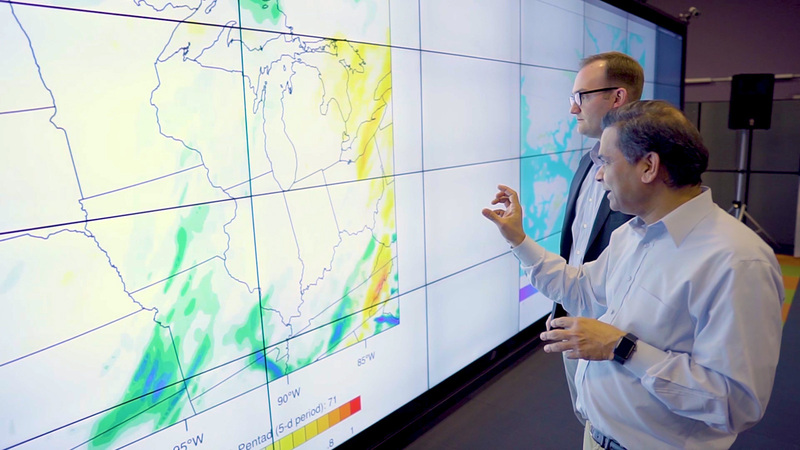 In partnership with AT&T, Argonne National Laboratory’s datasets help pinpoint extreme weather risks. A recent collaboration between AT&T and the U.S. Department of Energy’s Argonne National Laboratory has yielded climate model datasets that could dramatically improve the ability to project changing risks to infrastructure from severe events, as well as from increased inland and coastal flooding. Wind speeds of 90 miles an hour for a large portion of the southern Florida coastal region. Those predictions arose from a climate analysis tool that combines data analysis, predictive modeling and visualization for vulnerable locations in North Carolina, South Carolina, Georgia and Florida. The tool will help AT&T plan for and make the climate adaptations necessary to help ensure the safety and service connectivity of its employees, customers and host communities, according to David Brannegan, director of Argonne’s Decision and Infrastructure Sciences division. Argonne’s physics-based regional modeling system, which downscales global climate projections to local scales, bolstered the research that generated such results. Most climate modeling is done on a scale of 100-kilometer blocks. The Argonne system downscales to 12 kilometers using a physics-based model, the most localized climate model currently available that covers the entire United States. “That’s a fairly large area if you think about it, but it’s fairly small if you’re trying to do a climate model,” said Rao Kotamarthi, Argonne’s chief scientist in the environmental science division and the project principal investigator. This work has generated 700 terabytes of downscaled regional modeling data — the computer memory equivalent of 217 million photographs. No other organization has access to that much high-resolution climate modeling data for North America. With the AT&T project, Argonne built upon its climate-modeling experience in performing a variety of infrastructure resilience projects across the country. These projects include predicting the impact of hurricane and sea-level rise on energy infrastructure of coastal Maine and assessing heat-wave impact on the electric grids of large U.S. cities. The two words that summarize the latest project are ​“risk” and ​“resilience,” said Thomas Wall, Argonne’s senior infrastructure and preparedness analyst. Risk analysis helps determine how climate change could adversely affect AT&T’s business and the communities it serves. One of Argonne’s strengths is working with partners like AT&T to pinpoint which specific climate impacts from among the seemingly endless data sets that the laboratory could produce would best serve the company’s needs. Argonne’s interdisciplinary team consisted of researchers from the laboratory’s divisions of Environmental Science, Decision and Infrastructure Sciences, and Mathematics and Computer Science. The team wields a rare combination of expertise in climate modeling, hydrologic and costal modeling, and infrastructure resiliency analysis and planning. AT&T contributed the expertise of its climate resilience project team. Led by Shannon Carroll, AT&T’s director of environmental sustainability, the team included company executives, data scientists and geographic information systems specialists. The Argonne team developed three innovative climate datasets for the U.S. Southeast that projected the potential risk from wind and inland and coastal flooding. ​“We also calculated probability for the risk based on a set of ensemble simulations. What’s the likelihood and at what intensity considering projected future changes?” said Eugene Yan, a principal scientist in hydrology in the Environmental Science division. AT&T executives were especially interested in flood risk. To address that interest, the Argonne researchers developed a hydrological model that simulated how water flows along rivers and where it pools and overflows, as dictated by the surrounding terrain. The inland flooding simulation, performed at a grid resolution of 200 meters (approximately two football fields) for the entire Southeast region, including 35 million grid cells. The coastal flooding simulations included an innovative method for estimating how an increase in hurricane strength would affect flooding in the Southeast considering sea level rise and tide. “For each grid cell we calculated how current water depth may change in the future based on model calculations,” Kotamarthi said. They performed similar calculations for wind speeds. The Argonne team then pioneered a new method for reducing the data mass from 1 petabyte (equivalent to about 500 billion pages of text) used for the entire project to approximately 100 megabytes (equivalent to about 40,000 pages of text) of analyzed output. The feat made the data more tractable for use by AT&T’s data scientists. “We reduced the data into analytical functions that can be used to quickly reproduce the modeled distributions. This they can easily use in their software and figure out what to expect for each cell,” Kotamarthi said. Making the complex simulations possible were the supercomputers of the Argonne Leadership Computing Facility (ALCF), Argonne’s Laboratory Computing Resource Center and the National Energy Research Scientific Computing Center (NERSC) at Lawrence Berkeley National Laboratory. The ALCF and NERSC are U.S. Department of Energy Office of Science User Facilities. “Without supercomputers and the ability to do a lot of simulations very quickly, we really couldn’t do any of this work,” Wall said. For partnership inquires, email partners@​anl.​gov or call 1-800-627-2596.